Indian skipper Virat Kohli hit a belligerent 29th century in the match against Sri Lanka. In the process, he overtook Sanath Jayasuriya's record of 28 ODI centuries. Indian skipper Virat Kohli hit a sublime 29th century in the 4th ODI against Sri Lanka on Thursday. Kohli slammed 2 sixes and 17 fours in his knock of 131 runs off 96 balls as India look to sweep the ODI series against Sri Lanka. 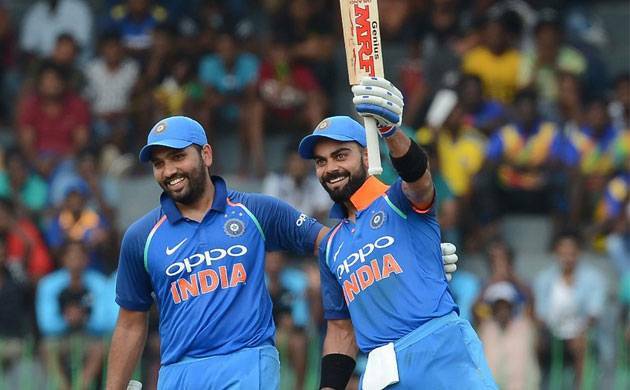 Rohit Sharma too hit a sublime century which was also the opening batsman’s 13th overall.The Indian skipper was joint third with Sri Lankan legend Sanath Jayasuriya’s 28 centuries going into the match. After the 29th ton, he is now only behind iconic batsmen Sachin Tendulkar (49) and Ricky Ponting (30) in the ODIs.This was Kohli's seventh hundred against Sri Lanka in ODIs - the second most by any batsman after Sachin Tendulkar (8). Kohli, with seven centuries, is also second on the list of most ODI hundreds by an Indian captain after Sourav Ganguly, who had scored 11 tons. India received an early jolt after opener Shikhar Dhawan was removed by pacer Vishwa Fernando in the second over of the innings. However, Kohli took charge as soon as he come out to bat and started hitting a flurry of boundaries. He completed his fifty off only 38 deliveries, with nine fours. Further, he then opened up some more to leave the Sri Lankan bowlers running for cover.In the process, Kohli also completed 2000 ODI rins against Sri Lanka.